As proud owners of Rottweilers, we want to make sure our pets stay happy and healthy. When you notice signs that something may be wrong, or that something is different, it is best to be cautious and look into what is different, and to find out what is causing it. 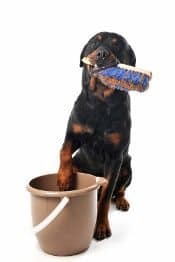 If your problem happens to be that your Rottweiler is bugging you to urinate much more frequently than their normal routine, this is something that should be looked into. There are a number of different things that could cause frequent urination. You may need to take your dog to your local vet to be sure that they do not need medical attention. 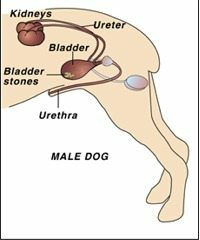 Urinary Stones are common in dogs. They can be found in the kidneys, bladder, and urethra, but generally are found in the bladder. The formation of crystals or stones in the urinary tract can be caused by several different factors, and are often working together to cause the problem. The formation of the crystals or stones could be from mineral crystals in the urine, bacteria, certain medicines, diseases, excess Vitamin C, and an imbalance in pH of the urine. Cystitis is what they call it when your dog’s bladder becomes inflamed. It is believed that this condition can be caused by infection, polyps, tumors, and stones, yet the actual cause is many times unclear. There are some symptoms you can look for if you are concerned that your dog may have cystitis. The sign to look for are frequent urination, straining to urinate, difficulty urinating, and blood in the urine. Kidney disease is sadly one of the most common causes of non­accidental death in dogs. Although it is not clear what directly causes kidney disease, there are many things that are believed to be factors. Some things that can contribute to kidney disease are dehydration, blood loss, tumors, impaired heart function, infections, and toxins. Some medication for treating kidney disease cause blood to be present in the urine, so you may notice a discoloration of the urine if they are being medicated for kidney disease. Bladder cancer is generally something that only occurs in middle aged to older dogs. Bladder cancer is not quite as commonly what is causing frequent urination, but should not be ruled out. If you can not find another reason why your dog is urinating too often, it may be time to have them checked for bladder cancer. Unfortunately, this problem is not usually found early because it is much less common than urinary tract infections, or urinary stones, which are a much more common reason for frequent urination. Typical symptoms of bladder cancer are frequent urination, urinating small amounts, blood present in the urine, and infections. Urinary bacterial infections most commonly occur in the bladder, but can also occur in the kidneys, prostate, and urethra. Once diagnosed, urinary bacteria infections are generally easily treated. Unfortunately, urinary bacteria infections are the main cause of prostate cancer in male dogs. 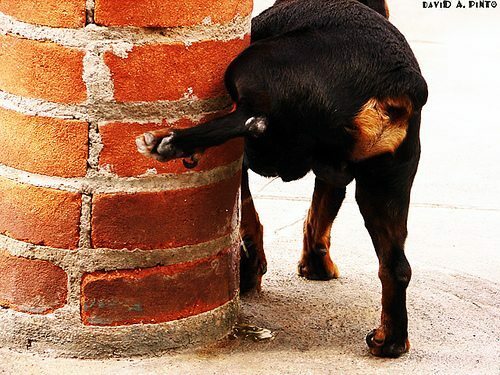 What happens is the bacteria enters the prostate and makes it extremely difficult for your dog to urinate. Some other conditions such as diabetes, cancer, and viral diseases affect a dog’s immune system and may contribute to this condition. Diabetes is a diseased state by which the dogs body suffers from either an absolute shortage of insulin (Type I) or the incorrect response from the cells to the insulin that is being produced, which is referred to as insulin resistant (Type II). Both types of this condition will prevent the dogs muscles and organs from converting glucose to energy, and will result in excessive amounts of glucose in the blood, which is referred to as hyperglycemia. Insulin is a hormone that is produced in the pancreas. It is released into the cells in response to the digestive conversion of proteins into glucose in the blood stream. Much of the food that is ingested is broken down into glucose which is a type of sugar in the blood as well as one of the body’s main sources of energy. Appropriate insulin function will trigger the liver and muscles to take up glucose from the blood cells and convert it into energy. Signs that your dog could be diabetic are frequent urination, excessive hunger (because the brain is not getting the proper amount of glucose, tricking your dog’s brain into believing it is hungry), lack of energy (because the insulin is not giving the muscles and organs the signals to convert glucose to energy), and increased thirst. It is important that you have your Rottweiler checked out by your vet if you notice any of the signs of any of these conditions. Many of these conditions can cause your dog a significant amount of pain and discomfort, but even more frightening is that some of these conditions can be fatal! 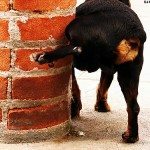 It is best to have your dog checked out regularly and if you notice any differences in their normal behavior or routine to check for the sign and symptoms of these common issues. Surgical removal is the preferred treatment for urethral stones. Surgery is often necessary when there is need for a faster resolution than diet change. If the stones are obstructing your dog’s bladder or urethra, it is very important to have them removed immediately before further problems occur.